Got Time for a Freight Date? PHOENIX (October 8, 2018)—Freight plays a vital part in our lives and the economy. Without it, we couldn’t buy gas or groceries. We couldn’t furnish our homes or enjoy our favorite entertainment activities. We couldn’t sell products or run a business. But when large trucks share space with cars, trains, buses, bicycles and pedestrians, conflicts can arise. This can result in traffic back-ups and concerns over safety and efficiency for neighborhoods, businesses and freight providers alike. That’s why the Maricopa Association of Governments (MAG) is hosting a neighborhood meeting to hear from you. 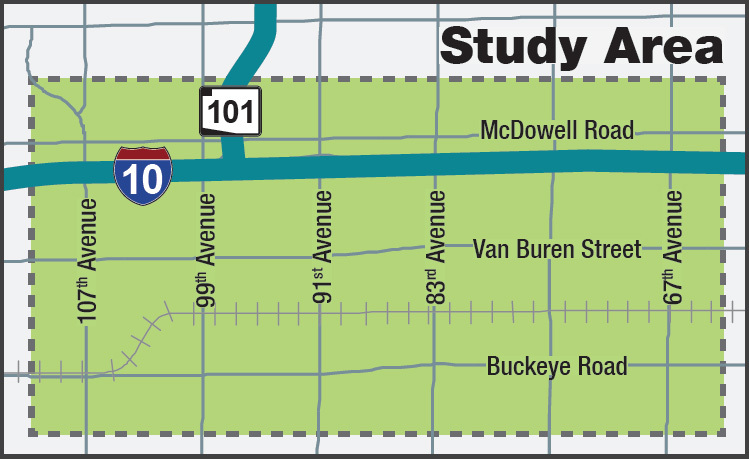 The purpose of the project is to help people and goods move more efficiently and safely through the area, which extends from Lower Buckeye Road on the south to McDowell Rd on the north, and from about 107th Avenue on the west to 67th Avenue on the east. The project area is mostly industrial, with smaller amounts of residential, vacant, agricultural and commercial uses. The roads in the area are often congested. The study team will observe and document overall traffic congestion and safety concerns, identify truck patterns, and determine high-priority locations where improvements are needed. The team wants to hear the direct experiences of those who live or work in the area to assist in identifying areas of concern.